Discussion in 'Backpacking' started by JosephDurham, Mar 14, 2019. I prefer bottles or canteens. I tried a bladder for a while and it just didn't suit me. My wife is the opposite - she much prefers a bladder. Metal canteen cause if you get stuck somewhere you can filter and refill it then sterilize all in one. jmho. I have had multiple camelbak failures over the years and have finally given up on them. They always fail at the most inopportune time too it seems. They do greatly aid in staying hydrated though. Never had an issue with one in a day pack, they seem to not hold up in the long term in a larger/full pack. On the move I now use a mother carrier so my water is easy to access and doesn’t require me to take off my pack or otherwise fuss with retrieving and returning bottles to/from their pockets. While biking I had a small camelbak M.U.L.E with a bladder. Didn't use bottles then. I learned I really liked using bladders and started using them on other activities. Sterilizing the bladder I had was easy, I simply poured boiling water into it, let the hot water run out the tube a bit and drain. Depends on my activity and mood. The only bladders I have used are from Camelbak. I have never had any issues with them. I’ve retired a few due to my own fault. As long as only water is used in them they are fairly easy to keep clean. I have the scrub brush and the small brush for the tube so they get cleaned well. I also like the classic 1L Nalgene bottles. On my bike I have gravitated towards the insulated Camelbak Podium Chill bottles. I’ve taken them on hikes as well. Really it depends on what I’m doing. My kids all have Camelbak packs as well and they like drinking from the tubes. Have also used only Camelbak bladders - the smoke/black colored military version and components - without any issues whatsoever. Please note that I have no experience using the Camelbak civilian line blue bladders and components. I sometimes carry a pair of the old USGI stainless canteens, and/or platy bottles at times as well, depending on the pack used, and other varying considerations. I use a bottle like most backpackers for the same reasons. Bottles are simple and durable. I use a 1 liter pet bottle with a standard thread and a smartwater sports cap. This means I don't have to take off my cap until I go to filter water. It also means I can filter directly into my bottle. It also acts as a backflush for my filter. The Fiji bottle above is easy to get in and out of my pack one handed and so I prefer those or a similar size. The reasons I don't use a bladder are the same as most backpackers. I like bladders for Mountain Biking, but backpacking is a completely different story. kronin323 and squishware like this. See, all you filterers are already going all high-end luxury with your water supply. I'm used to just throwing in some iodine then waiting half an hour. Mattexian and MJGEGB like this. I'm surprised someone didn't come along with "See, all you chemicalers are already going all high-end luxury with your water supply. I'm used to just throwing a pot on the fire then waiting half an hour for it to cool off." I've been meaning to pick up some tabs as a backup, but prefer the filter for speed, taste, and convince. I really like the taste of mountain water vs the tap or bottled stuff at home. I prefer not to mess with it more than needed if I can avoid it. kronin323 and ineffableone like this. For sure, the iodine stuff tastes nasty. We did use boiling in certain circumstances, though. One was to melt snow - as most of you likely know already, you don't eat snow (yellow or otherwise), it takes too many of your body's calories to melt it than you benefit from the water. Instead you melt it first, and despite how pure snow is supposed to be, you still boil it to sanitize just to be safe. Another circumstance, sometimes your entire group starts feeling bad at the same time. In that case you'd get a big pot boiling and sanitize all your group and individual cookware. Mattexian, Ptpalpha and MJGEGB like this. Yup I grew up as a kid using iodine tablets. The Sawyer filters have been awesome for me. They are cheap and easy to use. Only thing to remember is to keep them warm on cold nights, thus why a backup is not a bad idea. Being able to filter a liter of water on the side of the trail in a couple of minutes is awesome. Or other folks just put the filter right on top of the bottle and filter as they drink. The life straws don't seem versitle to me. The Squeeze and Squeeze Mini are what I recommend. You can use them like a straw, direct connection to a bottle, in line for a bladder, or gravity via the coupler which is my preferred method of use. Ptpalpha and kronin323 like this. It depends on where I am going and how far. If I am going be putting on some good miles, I find that Smart Water bottles work great. Combine it with a Sayer min and you hardly have to spend any time stopping to refill water. I prefer to use Nalgene bottles while hiking, only because I can gauge how much I am drinking during the day, and how much is left in the bottle as I look for a source to refill it. With a bladder/reservoir, I can't tell very easily. Since I use Polarpure (pure iodine) I wonder what it would do to the inside of a bladder. However, when canoe racing I can't take the time to grab and open a bottle to drink, so it has to be from a bladder and tube. The problem still remains and on long races I have to carry more than one at my feet to switch in for after I run out on the first one. I also hate to clean the bladder, and the tube tends to get black mold inside if I am not careful using a long flexible brush at the end of every use. Which do you prefer and why? Hydration bladder or bottle; or do you like to use both? Are you completely against the hydration bladder? I prefer to drink out of a hydration bladder while actually hiking, but I don't much like to refill them in the woods. I have both, but usually use a bottle as it's easier to deal with when refilling from a filter. MDs and medical scientists now say otherwise, stating thirst is simply you body's way to tell you to drink. If you do that your body's water deficit will be nil or trivial. Simply drink once you are thirsty. Now if you ignore the thirst and don't drink, that thirst is often then accompanied by excessive sweating, decreased urine, headache, fatigue, lethargy, cramping, dizziness --- then it's too late and is dangerous. The solution? Drink when you are thirsty. I've always thought that was mistaken (the "If you're thirsty it's too late"). Never made logical sense to me--why have a biological indicator that's too late. It does make sense to me to drink when you are thirsty, though. I've been a bladder user my whole life. Never worried about sanitation. Just squeeze out what's inside and wash the nozzle at the end of the day. No leakage issue yet eithet. Don't get me wrong, I hit the bottle when it's passed round, and I'm not one to turn down a nip off a Mason jar either. But at the end of the day it's my bladder that I come back to. My local Walmart was closing out some 2L bladders, for $9, I grabbed a couple. I know that cheap can be just that. I've always been a bottle user, easy way to test. An independent duty medic convinced me in Papua New Guinea that filters were the way to go (and that was more than 25 years ago). I've been meaning to pick up some tabs as a backup, …. Water purification tabs carry their own issues. They must be stored correctly. They have a definite shelf life. Once opened, the bottle of tabs have a much shorter effective life. Their effectiveness is directly related to the temperature of the water (at least 68F) when used as well as its ph. Then you have to wait up to an hour before you can drink the treated water which must be consumed within the day. Also depending on how much water your are consuming, it's easy to exceed the recommended maximum iodine dosage. Filtration has none of these concerns. Filter unless you just can't. I was looking at these which I don't believe are iodine. Also the manufacturer FAQ page varies a bit from your statements. I believe @mtwarden uses them or something similar for his primary water purification method. I'd look at it as a backup or forth option. I stick with clear bottles which allows for UV purification to be used. And for backpacking trips (one or more nights spent along the trail) I've always had a pot as well as a stove. It probably would be overkill, but I worry one time I will forget to bring my filter inside with me when the temps are below freezing. I suppose I could also bring a very small amount of bleach, but that's never been too appealing to me either. I'll be sticking with my filters for my primary water purification method for sure. I was looking at these which I don't believe are iodine. Also the manufacturer FAQ page varies a bit from your statements. Those tabs are sodium dichloroisocyanurate (NaDCC). Basically a chlorine treatment. When I was working in southern Arizona, doing extensive hiking through rough terrain I used a CamelBak hawg with one of the no longer produced 6 liter reservoirs. I would fill it 3/4 full of ice, fill to capacity with water. If I took a long enough break to stop and get into my pack, I had two 20oz Gatorade bottles with my home made "Gatorade" which I found more efficient for electrolyte replacement. I would usually do one at the major peak, to replace what I lost and one on my way out to help get me on the road to recovery. With the ice in the reservoir, it was ice cold water and refreshing all day, and would usually still have ice the next morning when I swapped it for fresh stuff. Never had an issue with it getting nasty, but I cleaned it on my days off, when I had one. By the end of pretty much every day I had a white crust of salt over my shoulders and on my hat, but I never suffered a dehydration or heat related injury, and the cold water helped other people out on more than one occasion. In my personal traveling pack I keep a stainless nalgene and a 3 liter res with a quick connect Sawyer mini filter. I like the larger volume of water that I can carry with the reservoir, how much more compactly it stores and distributes the weight, less noise when partially full. I have applied pressure to the CamelBak reservoir (drop a knee onto the pack, and increase the weight as needed) to spray water for irrigation of cuts, filling cooking pots, giving other people a drink etc. Mattexian and kronin323 like this. I use both. 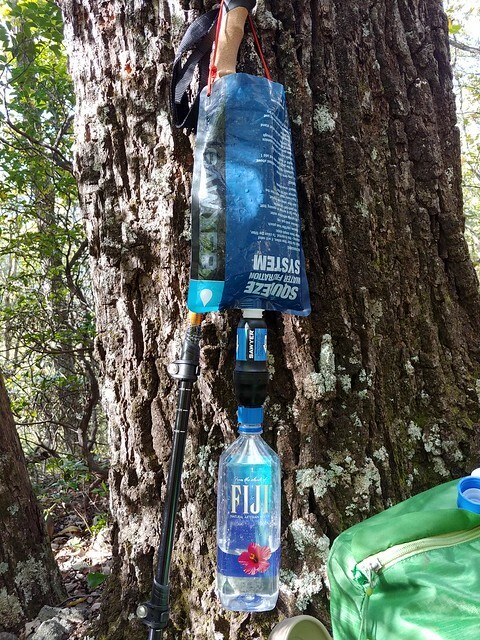 I really like the convenience of being able to sip from the bladder while on the trail, not having to stop and fumble getting a bottle out and back into a pouch or pocket. The bottles are nice in camp or when making a water stop, especially metal ones that snow or ice can be melted in on a fire and purification can take place in the bottle while you drink from the bladder. I rarely have needed to clean out the bladder, disinfect etc. Maybe at the beginning of the season I'll swish around some dish cleaner and flush the line real well but I haven't had any issues with stuff growing in there. I usually just rinse and go. It is a light way to go when you have a good source of water nearby to draw from . I'm in the mid south and water sources are relatively common. I tend to carry both, but I never rely on bladders as my sole container because I've seen too many leak, even new ones and name brand ones. However, I always like the option to carry more water if I need to for any reason, and since bladders don't really take up any space when empty I generally have one even if I'm not planning on using it. The bladder I've settled on is the Source WLPS 3 liter ("Widepac Low Profile System") because it's the "flattest" I've found when filled with water and is even better when filled only with 2 liters, which means it intrudes less into your packs storage space and doesn't feel like an awkward cylinder on my back as most bladders do. Plus, it doesn't use leaky screw caps making it take up even less room, which is important when you're using smaller ~25 liter daypacks... instead, it opens from the top to fill, which makes it easier to clean (I can get my hand in there with paper towel) and dry. I can't speak for the entire product line but the current mil-spec "antidote" series of CamelBak bladders have internal structure to flatten them out as well. They do have screw caps but they're big enough to put a fist through and the current design is quarter twist & can't be overtightened, so much easier than their earlier but similar looking designs. The tubes are far superior to my earlier gen versions, too - leakproof quick release connector where it attached to the bladder, insulated tube cover - I never really understood the value of the insulated cover since I don't mind warm water but it's valuable for the other extreme, keeping your tube from freezing up. Then it also provides abrasion protection. The mouthpiece itself has an easily manipulated protective cover and a heavy duty shutoff valve, quite a step up. I've got them in 1.5, 2, and 3L sizes for my various sized packs, just got back from a day trip with the 2L one. Mattexian and Burncycle like this. I used to use a bladder but have since switched to water bottles. They are just as easy to drink from but much much easier to retrieve from your pack for refilling not to mention much easier to put back in. My first long backpacking trip (6 days) I used a bladder, that same trip I learned how annoying it was to try to force a full bladder down the sleeve of a full backpack.